This, the third installment in my DIY baby clothes project, is my favorite so far! It turned out even cuter than I envisioned. As I planned out the sweater, though, I kept coming back to one problem: my daughter is in a stage where she is always lifting her shirt up to chew on it. I prefer outfits that snap underneath so that she doesn't constantly have her tummy exposed, especially as it gets colder this fall and winter. I decided to put a little bodysuit panel underneath the sweater, connected at the waist. You can't see it when she has it on, but it helps keep her little tummy covered. For that part I used an old t-shirt of my husband's. See? You can't even tell the bodysuit panel is there. My little girl is stylin' without her tummy showing, even when she pulls up the hem of the sweater to chew on it. This post is pretty long, but stay with me, this project really isn't that difficult--especially if you decide to make the sweater without the bodysuit panel! We're using the original hems and neckline edges, so most of it is pretty easy! First, you are going to cut out your pieces. Now, because we are working with a sweater, we don't want to have to put a neckline or hems in anything--we're going to keep the original neckline and hems, which makes for easy sewing and looks really professional. Fold the bodice back piece in half and lay on top of the front of your sweater, lining up the shoulder/neck edges. The neckline on the front of the sweater will dip a little lower than the neckline in the back. Cut out front bodice piece using back bodice piece as a pattern. The only part that won't be the same is the neckline, as mentioned above, so your bodice front piece should look similar to the bodice back. To make the bottom bodice pieces, lay your onesie on top of the sweater. Decide about how long you want the sweater, and line up the sweater hem with this point. I went with just above the leg openings. Using the first piece as a template, cut out a second piece just like it. Line up sleeve of onesie on top of sweater sleeve, matching up the hems and folded edge. Cut out sleeve, leaving about 1/2" seam allowance on sleeve cap and inner seam. Using the piece you just cut as a pattern, cut out the second sleeve. You now have all your sweater pieces--yay! If you just want to make a sweater without the bodysuit panel underneath, skip ahead to the sewing process. To cut out the bodysuit pieces, lay out your onesie on top of your old t-shirt with the back facing up. As you cut around the onesie, you only need to leave and extra 1/2" seam allowance on the sides; do not add extra seam allowance to the curvy bottom edge. Cut straight across the top just below the armhole edge (at the same place you did for the bottom piece of the sweater). Lay the onesie out on top of the t-shirt again, but with the front facing up. Carefully tuck the longer back part out of the way. Cut out the front the same way you did the back, adding seam allowance to the sides only and cutting straight across under the armholes. Now cut a couple of long strips across the body of the t-shirt, about 2" wide. It is important that these strips be cut out sideways across the shirt, parallel to the shirt hem, in order to have the flexibility they need to. A couple of notes about sewing a sweater: using a ballpoint needle is best on knits. It is also helpful to stretch the fabric slightly as you sew, to help it retain some stretch. A serger works great, and is usually what I use on knits, but I didn't for this project. Knit fabrics don't unravel, so you don't have to worry about edge finishing. With right sides together, sew the bodice front and bodice back together at shoulder seams. Again, I seem to have no picture. Pretty sure some of my pictures for this post got lost somewhere...hmmm...anyway, just make sure you like up the ribbing on the neck edge, because that will be your finished edge. Open up the bodice so that you have a circle hole in the middle at the neckline and the bodice front and back are both laying flat. You'll have a sort-of C-shaped edge on each side with the shoulder seam in the middle; this is the armhole edge where you will be attaching the sleeve. We're going to go ahead and attach it now, before we sew the side seams, because the sleeves on baby clothes are so small, and this makes it easier to work with. With right sides together, pin the top of the sleeve to one of the C-shaped edges. Your curves will be going opposite directions, but knit fabrics like sweaters are pretty flexible, so lining them up shouldn't be too much of a problem. I open up the C-shape to match the sleeve cap as I pin. Sew this seam using a 1/2" seam allowance. Keeping right sides together, pin underarm edge of sleeve and bodice. Make sure the sleeve hem is matched up well. In fact, I recommend starting sewing at this edge so it doesn't shift during sewing. Stitch in one continuous seam, pivoting needle at armhole edge to stitch that little inch-long side seam. Turn your sweater right-side out. Look how cute it's turning out already! With right sides together, sew the bottom bodice pieces together at side seams, being careful to match up hems well. If you're not adding the bodysuit panel, you're almost done! You'll just sew this piece to the top part of your sweater and that's it! If you are adding the bodysuit panel, set this part aside and let's get started on the bodysuit. With right sides together, sew the bodysuit pieces together at the side seams. Normally I would have used a serger for this, but in all honesty, it was late at night and I didn't feel like changing my serger thread for just these two seams. Take the long, skinny strips you cut and sew them together end to end. You are going to use this as a binding on the curved edge of the bodysuit. Now, because this fabric won't ravel, I did this the easy way and didn't put a finished edge on it. After all, it won't show when it's tucked into Baby's pants. With the right side on the outside, fold the strip in half and sandwich it around the bottom edge of the bodysuit. Starting at one side seam, sew the binding around entire bottom edge, using about a half inch seam allowance. The binding will be too wide--I did it this way intentionally so that it's easier to work with. Don't worry about the fact that it looks a little rough when you're done. See how much better it looks now? It's not perfect, but again, it won't show. See how I put the snap on the left on upside down? Yeah, that was fun to fix! If I had any concerns before about these snaps coming loose, I don't now! Once they are on, they're there permanently! I do love how they look when they're finished. Slide the bodysuit panel inside the bottom bodice piece. You will not have right sides together; both pieces need to be right-side out, so the right side of the bodysuit panel will be against the wrong side of the sweater. Pin the top edges together, matching side seams. If the two pieces don't match up exactly, just stretch one to fit the other; it is very forgiving. Sew the two together with about 1/4" seam allowance, stretching the fabric slightly as you sew. With right sides together, pin the bodice top to the bodice bottom with the bodysuit. Make sure you line up your side seams and place the front of the bodice top with the front of the bodice bottom. Sew through all three layers (bodice top, bodice bottom, and bodysuit panel) using a 1/2" seam allowance and stretching slightly as you go. Trim down seam to 1/4", if desired, to eliminate some of the bulk. Open up the sweater and voila! You're done sewing! You can leave it as-is or add some embellishments. Inspired by the lovely dark orange, I added some buttons that look like fall leaves. Originally I had planned to stop there, but I still felt like it needed something. Then this brilliant idea occurred to me, and it worked like a charm! Thread a yarn needle with ribbon. If using a wide ribbon, like I did, it helps to cut the ribbon end at an angle and feed the point through. (Do not use ribbon with wire edges). Pull a few inches through the needle. Figure out where you want the bow to be, and start there. I wanted the bow in the center directly under the buttons, but you may want yours offset to the side or something. Push the needle through the sweater, pulling the ribbon along with it. It might take a little wiggling and coercing to get the ribbon to pull through sometimes, but usually I found it went through pretty easily. 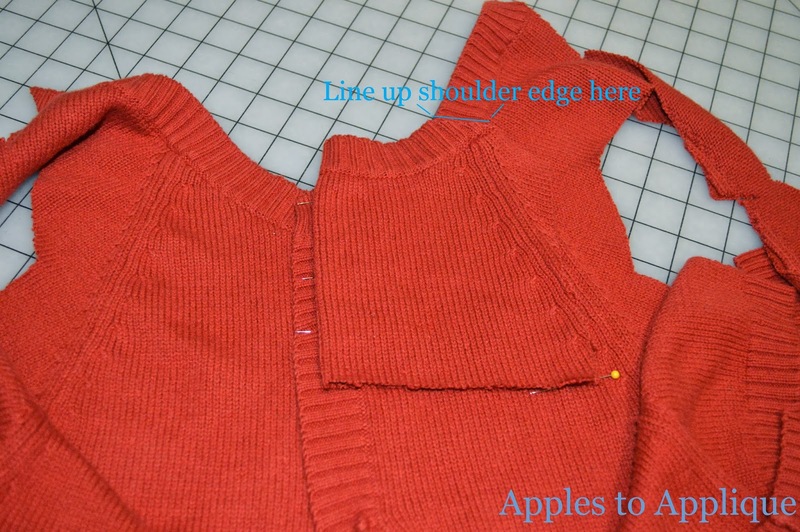 Continue sewing the ribbon through the sweater, keeping your spacing as even as possible. I left about a 1/2" gap whenever the ribbon was on the underside, and about 1" when the ribbon was on the outside. I just eyeballed it, but you could measure around and put pins where each stitch needs to go. Continue all the way around the sweater, ending with your ribbon coming out just 1/4" or so from where you started. Tie the tails in a bow. At this point I cut the ribbon ends and sealed them with a little clear nail polish. Then I decided to actually put a few tacks in the bow by hand so it can't come untied, because I know my little girl would have that untied in two seconds flat. My little girl is ready for some fall fun! First to comment and first to follow your RSS feed on feedly. Love you tutorial. I think I want to try that with some sweaters for my twin sons.